Right now we have an amazing single bunny up for adoption, and are working with area shelters to assist with adoptions of the rabbits in their care. We are unable to actively rescue at this time due to lack of resources and volunteers. So many need saving, but we need places for them to stay until they find their forever homes! Hi, my name is Hazel. I was named after the main character in the Richard Adams' novel, "Watership Down" - a courageous and wise young male rabbit who leads his group of friends and relatives to safety. Some call me Hazel-rah after that character, as the "rah" is rabbit-speak according to the book for "chief" or "leader". I definitely do like to lead the way! I love affection! You can pet me most of the day and I will be quite happy. But, I also like to have time to explore, and can easily get into trouble with my natural curiosity. I don't mean to misbehave, but everything you humans have seems so very interesting. 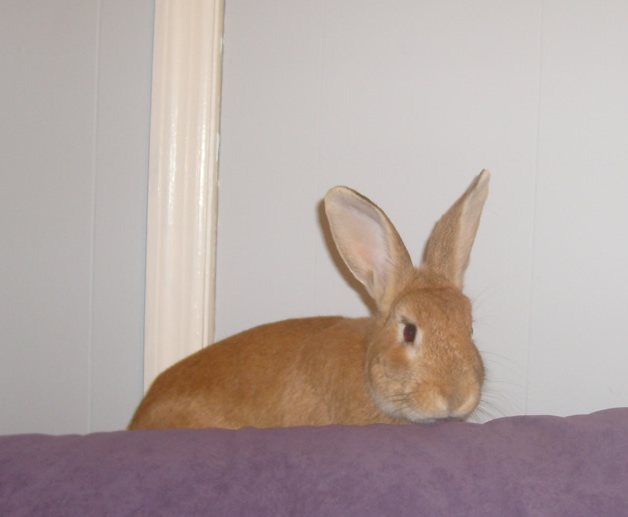 You will have to be very vigilant about bunny proofing to keep me safe, and have a lot of energy to keep up with me. As affectionate as I am, I do get startled very easily if someone approaches me too fast, so I'm afraid of young children. It makes me so frightened that I run away as fast as I can. I also get frightened by loud noises, especially when children are playing and singing or yelling during play. I'm still very wary of dogs, but I might be okay with an elderly dog who doesn't bark often. I haven't met a cat face to face yet, but a calm older cat might be okay - we will have to see how I feel about that! I was picked up by Animal Control in late December, just a few days before Christmas. I don't know why my last family didn't want me anymore, but they turned me out in the rainy cold and left me to starve. I think that a few animals tried to hurt me, and my ability to run away so fast was the only way I survived. I was so glad someone found me! I spent nearly a month in the Charleston Animal Society, which was much better than being outside, but it was loud and scary there sometimes too. Now, a nice lady with the Lowcountry House Rabbit Society is fostering me for them and helping me to find my perfect forever home. Are you the right home for me?